Just before the I WW, a small village in the North of Germany. Disturbing events start taking place. Terrible punishments, strange accidents. Is there something called Evil? maybe not and it's all in our mind. 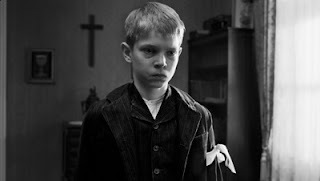 The White Ribbon is the title in English and the director is Michael Haneke, the sdame who directed La Pianiste (with Isabelle Huppert). A film to be seen absolutely. It's on several cinemas in Lisbon. I saw it at King, near Av. Roma. Brace yourselves for human moral misery.